What is the Basically Beethoven Festival? 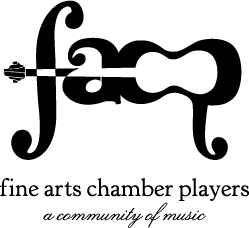 The Basically Beethoven Festival was Fine Arts Chamber Players’ inaugural concert series. Since 1981, the Festival has provided North Texas with free chamber music concerts during the month of July, a traditionally slow time for arts events in Dallas. The Festival features professional musicians from local ensembles performing a diverse range of music. Every program includes a Rising Star Recital at 2:30 pm and a Feature Performance at 3 pm. Rising Star Recitals present local, gifted young musicians, many of whom are winners of area music contest and concerto competitions, and Feature Performances showcase professional musicians from across the Metroplex. Admission is free and performances fulfill FACP’s commitment to produce classical music concerts with no barriers to attendance. Performances are easily accessible by public transit and are attended both by longtime arts patrons and area residents who are new to classical music. Families with children are welcome. Festival performances are routinely standing room only—arrive early for the best seats! Check back for 2019 Basically Beethoven Festival concert details!